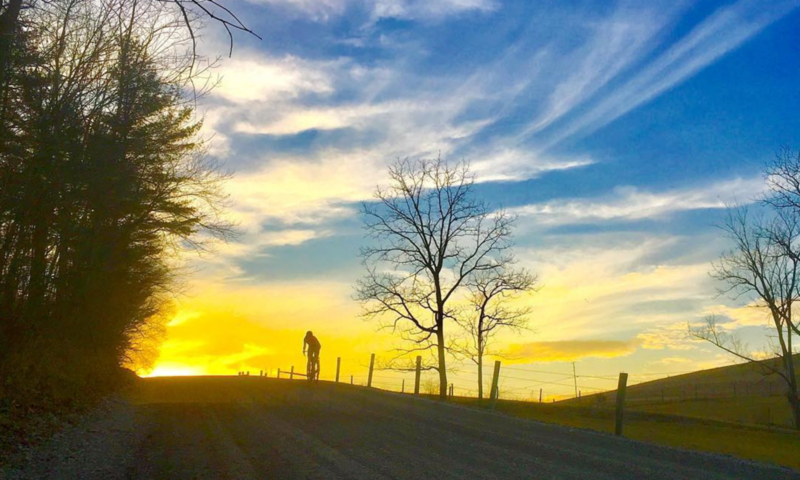 It’s dawn on the ridge. The sky casts an orangey hue over the recently-exposed leafy ground, ground that has been hidden by ever-thickening layers of snow for the past couple weeks—until this weekend, when temperatures climbed into the 50s and the rain washed all signs of winter away. Down the hill, on our lane, canoes sit atop my car, ready for a day on the river. For the past 12 hours, we’ve been checking the river gauges, hoping Trough Creek becomes runnable as we expect it to with all the rain and snowmelt. 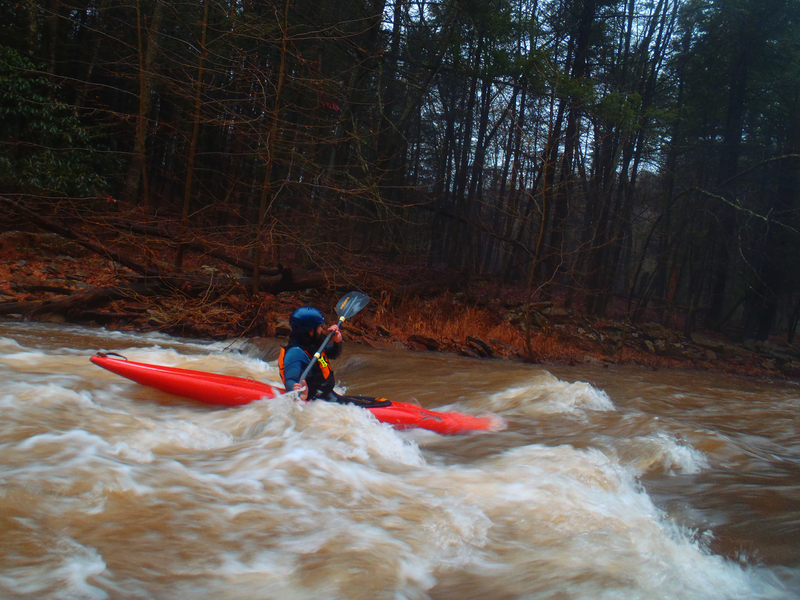 The plan today is to do 2 runs of Trough Creek, one in the morning and one in the afternoon, in order to make the most of the warm temperatures and high water. We down coffee and head out the door, meeting fellow paddlers Joe and Caleb down the street to caravan to the Creek, where we are joined by Tony, making our morning crew complete. We quickly set up shuttles and hit the water. Chute through a beaver dam. Tony in a surf wave. Surfin’ by the rock wall. It’s a good day to be on the water. 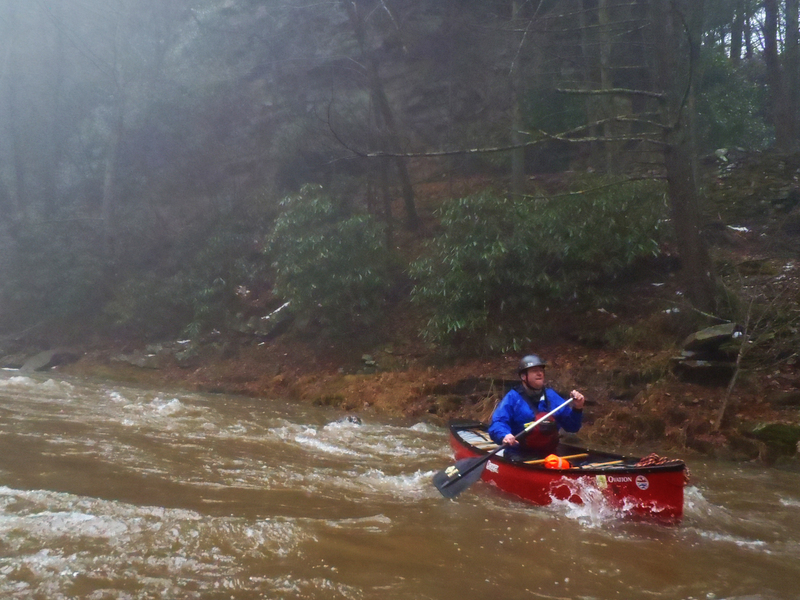 Evan and I are paddling tandem in a Mad River ME borrowed from our friend Jeff. It’s an OC-2 designed for whitewater, and this particular boat was used to race slalom, so it’s designed to be fast yet maneuverable. 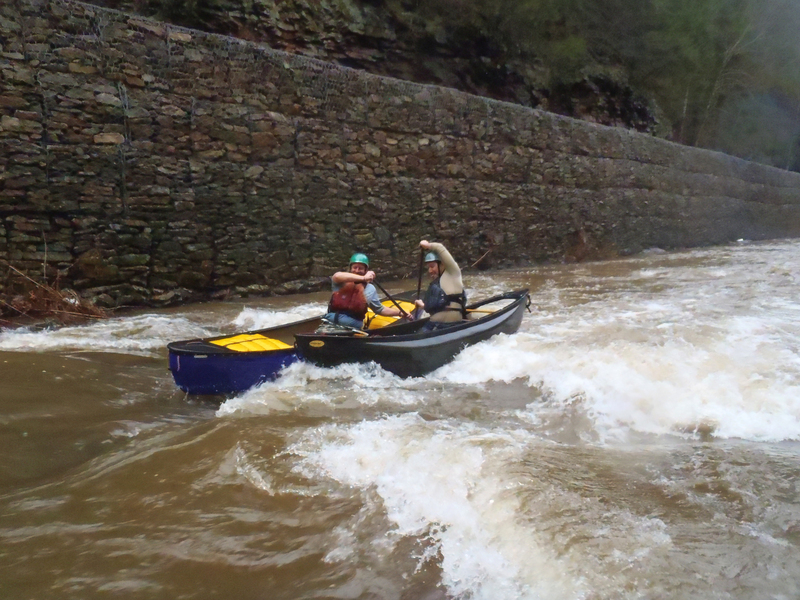 It was a wet ride, however, as the bow tends to want to dive into holes, and we found that our weight distribution wasn’t ideal for maximum control of the boat. 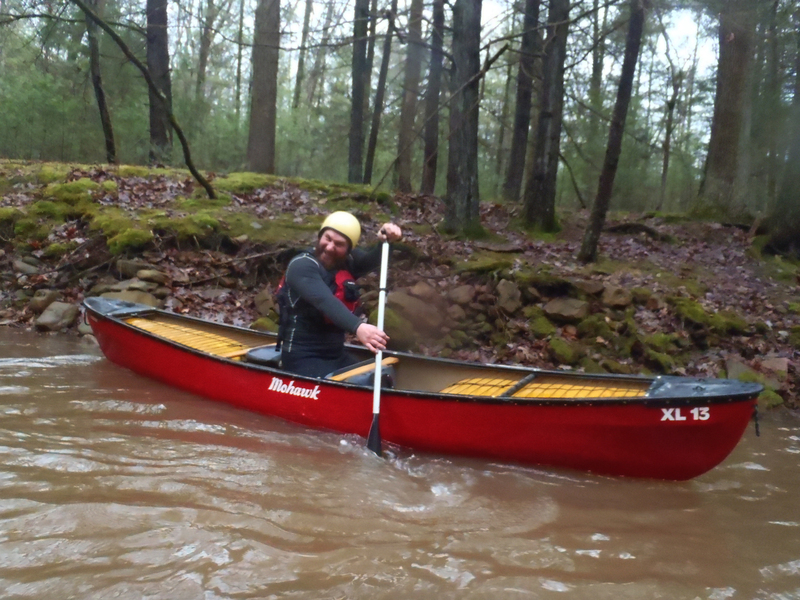 I, as the bowman, didn’t feel like I had as much control from the front as in other tandem canoes that we have paddled together. But it was still a lot of fun, and a great boat to surf and play in. 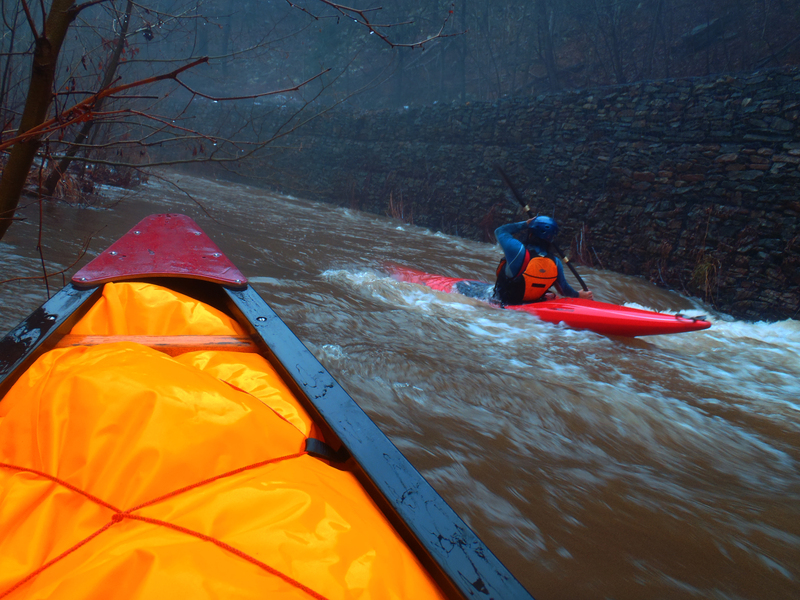 Paddling tandem isn’t always easy, especially with a significant other. 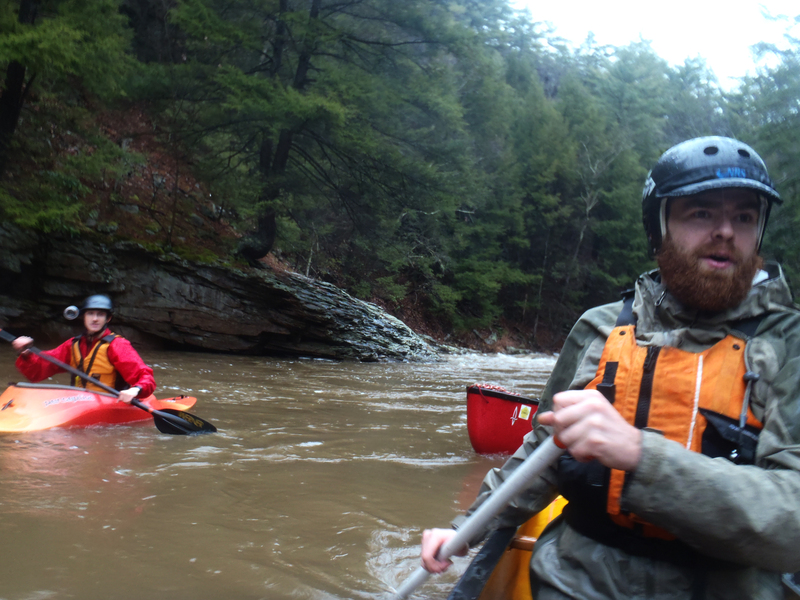 Luckily, Evan and I are pretty good at it—we’re both experienced paddlers on our own, we have opposite on/off sides, and in general, we communicate well and enjoy doing the same sorts of maneuvers on the river. But sometimes, the communication does break down, a command is misunderstood, a warning of “watch the rock!” isn’t heard. 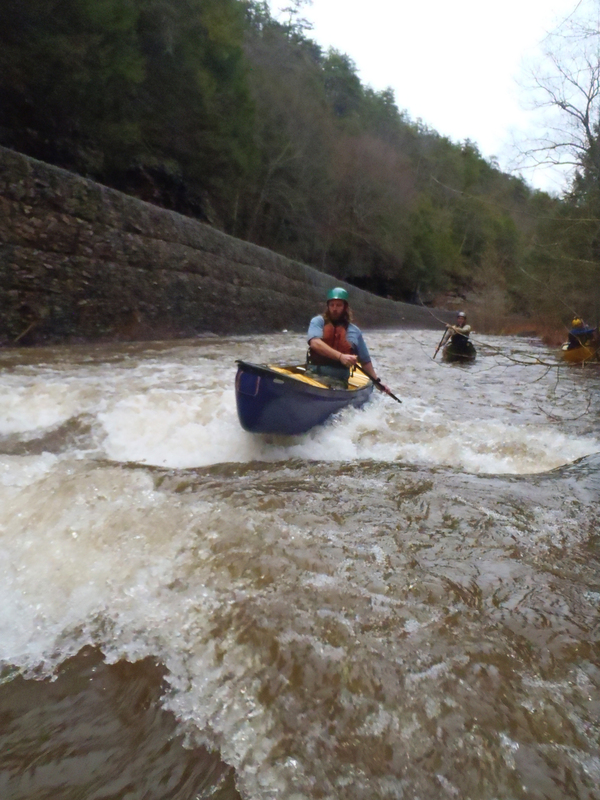 However, the occasional slip-up and frustration with each other is greatly overshadowed by the satisfaction of pulling off a difficult move and the bonding that occurs while working together to paddle the same boat down the stream. 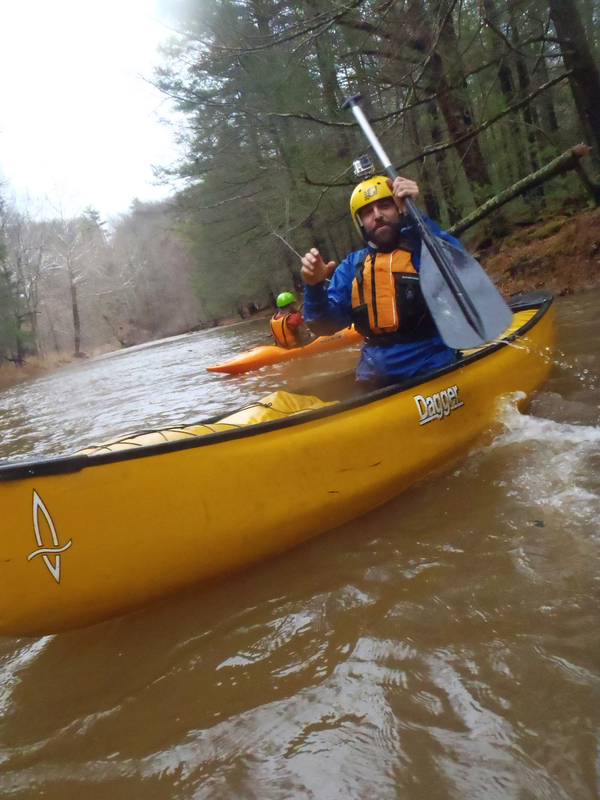 Both of us are very excited to paddle together more and tackle harder and harder rivers as a team, learning what works and what doesn’t, and how to best simply and effectively communicate our intents to each other on the river when time is of the essence. 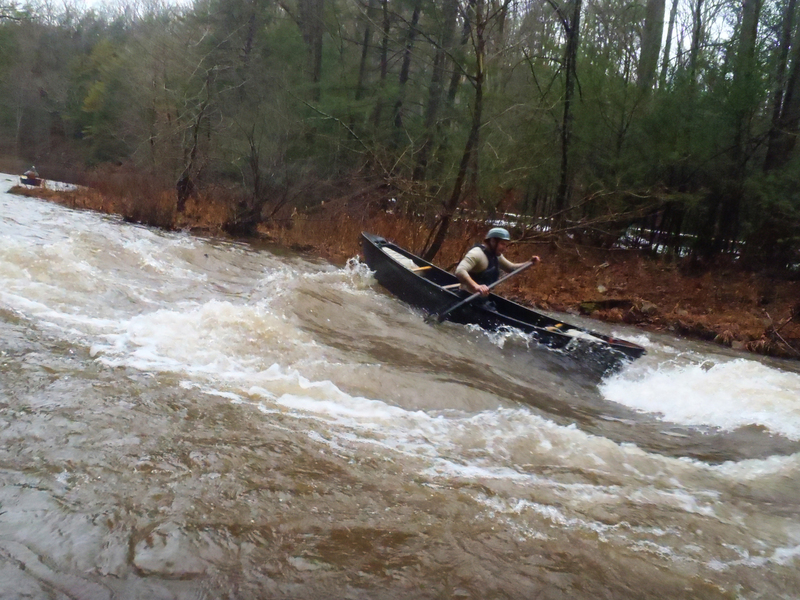 Sometimes, there’s just nothing you can do to stop an inevitable swim out of the canoe. 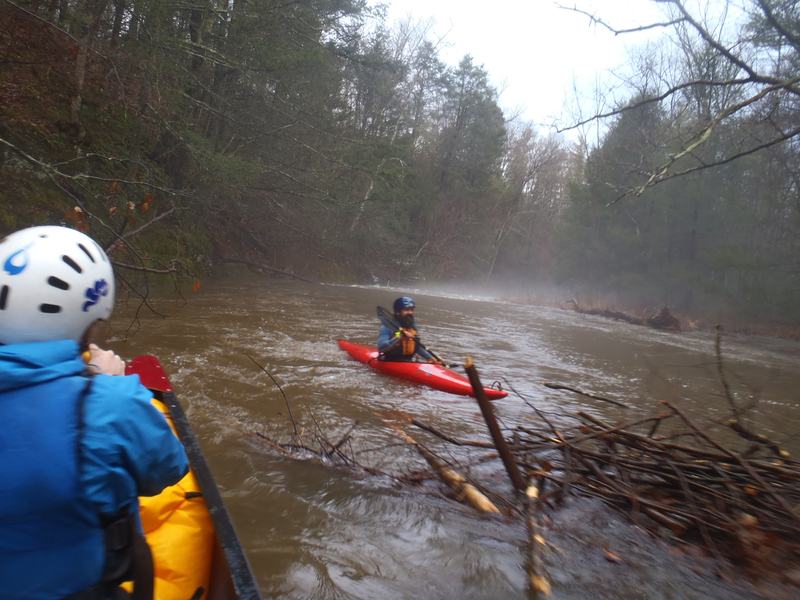 As we dropped into a particularly nasty hole towards the end of our first run down the stream, the bow of the canoe wanted to go one way while the stern went another. 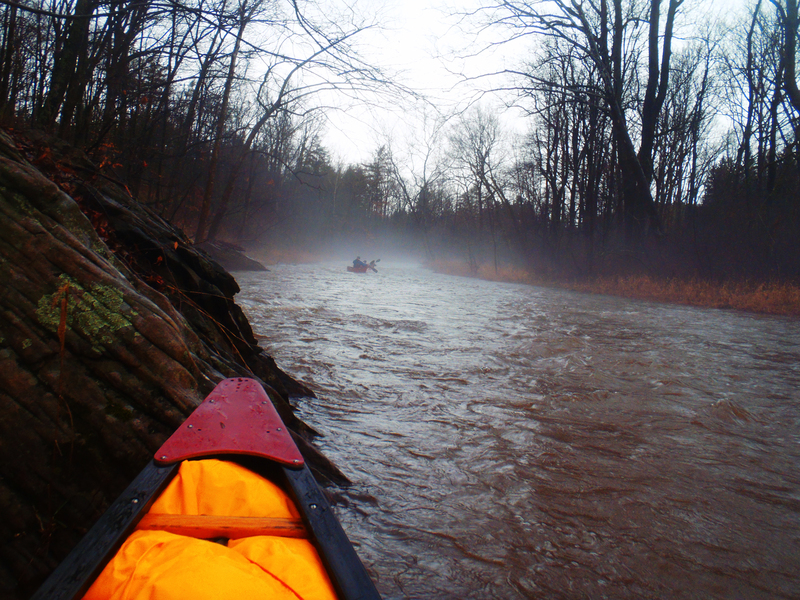 As the canoe leaned and water began pouring in, I knew we were going out of the boat. I hit the cold water, and my breath was sucked from my lungs. It didn’t feel that cold on my body, but I felt like I couldn’t breathe, couldn’t move. But I needed to get to shore. 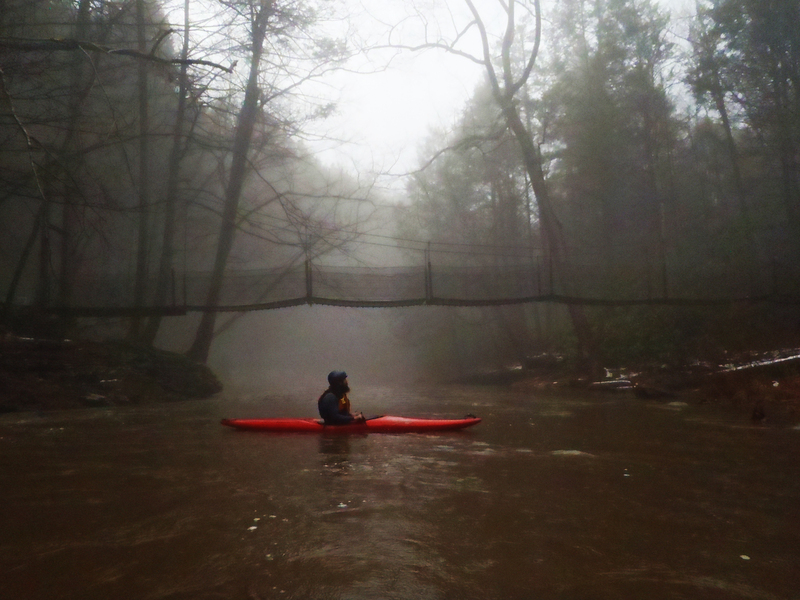 I grabbed the spare paddle that had floated out of the canoe, and began swimming in what seemed to me like slow motion. I finally felt the stream bottom beneath my feet, and I shakily stood up, the wind still knocked out of me by the chill. Evan and I exchanged high fives. “Good swim!,” he exclaimed. It was a good swim. I hadn’t had one in a while. 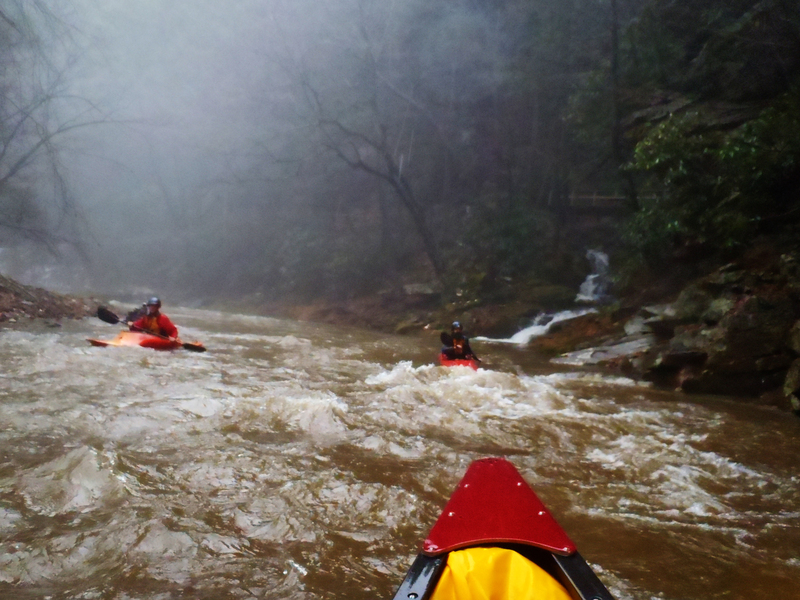 Yeah, it’s no fun when it’s cold, but as we say in the paddling community, if you aren’t swimming you aren’t trying hard enough. And you always learn something, even if it’s just that in the end, it’s not that bad. Back in the boat it was, for a fairly uneventful paddle to the end. While I shuttled Joe back to his vehicle, Squirrel showed up with a package of sausage and a bag of charcoal, and began cooking up lunch at the pavilion. I stood over the warm grill, shivering, now thoroughly chilled from the inside out from my soaking clothes. But if I took off the wet neoprene, I’d never get it back on, so I sucked it up and continued to shiver, alternating between warming up in the car and hanging out outside with the group. As we were loading the ME onto my car to shuttle boats back to the put-in, I looked up at the hull that I was lifting onto my roof rack and instead of solid red, I saw sky. “Oh my god,” I said, my mouth hanging open as I stared in disbelief. Evan quizzically looked at where I was staring, and he too saw the gaping hole in boat. No wonder we had so much water in the boat. There were a brief few moments when we thought we could patch the wound with duct tape and paddle it again on the second run, but that thought was quickly dismissed and instead we asked our friend Levin to stop at the shop and grab the Michicraft for us to paddle instead. We still had to break the news to Jeff that we had put a gaping hole in his boat, but luckily he was pretty good-natured about it, and we all laughed it off and prepared for our second run. 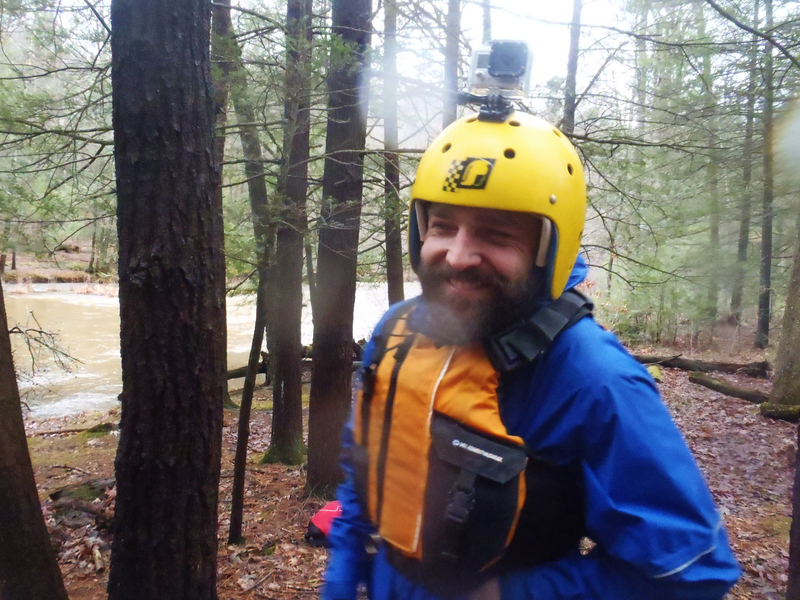 Levin’s got the GoPro and his excited face. 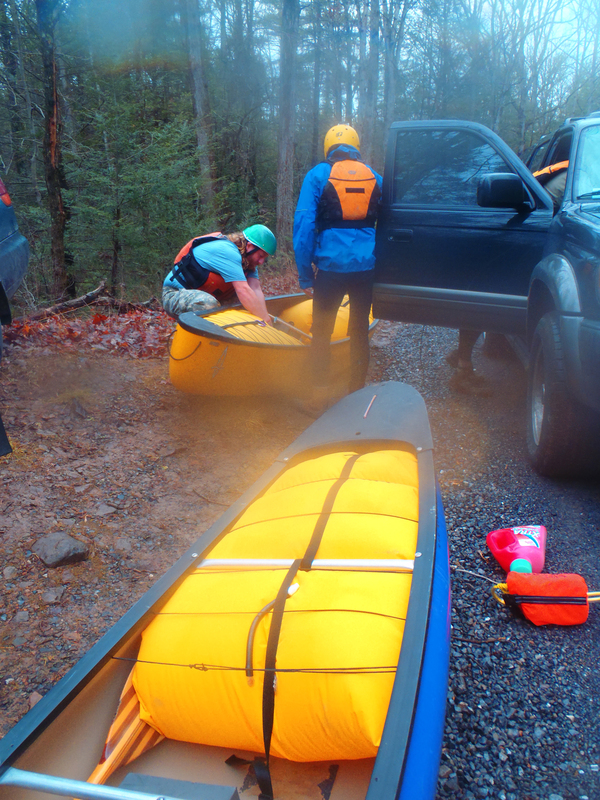 We got everybody geared up and hit the water once again, this time with a couple more inexperienced paddlers. We had them practice grabbing eddies and pulling off other simple maneuvers that could be useful in saving oneself in a sticky situation. Levin, who didn’t make it all the way down the creek last time he paddled it because he swam too many times in 19-degree temperatures, only swam once today, and finally was able to make it all the way to the take-out. 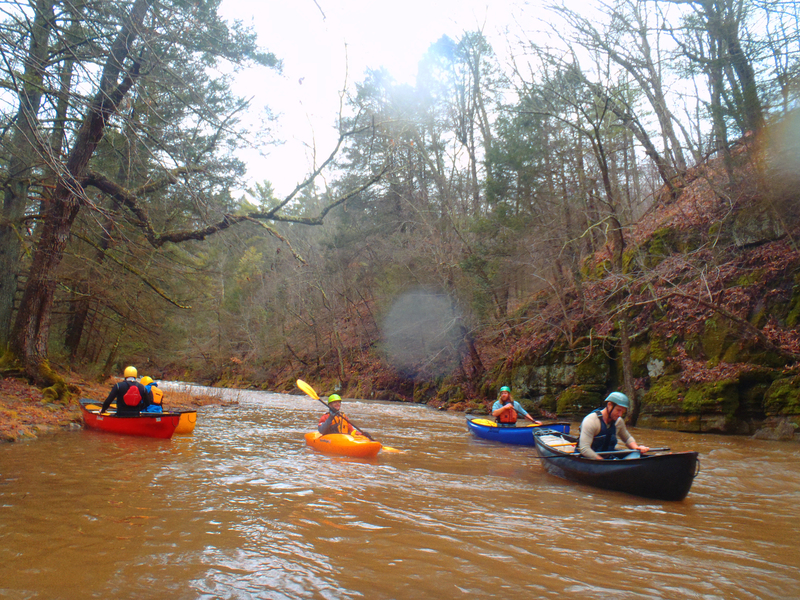 With a group of 7 of us in the afternoon, it was the most people I’d ever paddled with on Trough Creek, and the dynamic formed by the different personalities and skill levels on the water was fun and invigorating. Adam bounces along in the Zephyr. Levin doing the ol’ switch-a-roo. Jeff surfing in the Shaman. By the time all the boats were strapped on and said our goodbyes, the sun had long set. Evan and I excitedly ordered a pizza from the place down the street, then took it home and filled our bellies with the delicious, cheesy, saucy pie. I hit the hay early, my entire body aching and tired — but in a good way, the way that lets you know you did something today, the kind that leaves you satisfied and sleeping like a rock, to wake up the next morning feeling rested and ready to take on another week. Previous PostPrevious The arrival of winter.